Bringing scientific discoveries into clinical practice, testing of insights in living biological systems, is at the heart of translational research. And few scientists know this path better than Memorial Sloan Kettering Cancer Center’s Dr. Ross Levine. 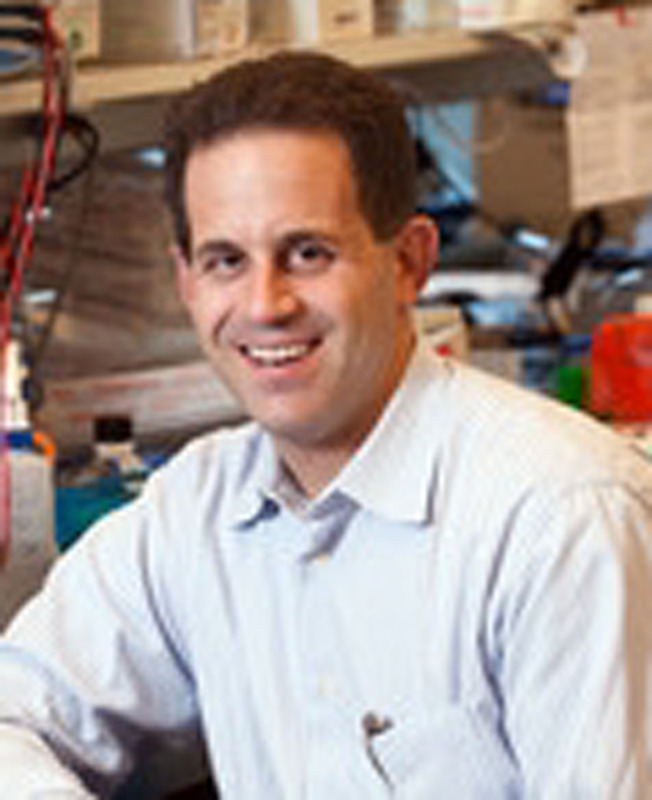 Ten year’s ago, Levine’s lab was one of the five international labs that concurrently published the initial JAK2 v617f mutation’s association with proliferation of blood cell lines. These findings led to the development and deployment in 2011 of ruxolitinib (Jakafi), the only FDA approved JAK inhibitor, currently in widespread use to treat myelofibrosis and, more recently polycythemia vera. Although the JAK-STAT pathway and the JAK2 mutation were clearly implicated in various MPN phenotypes two obstacles to eradicating these diseased states were quickly observed. Ruxolitinib reduced splenomegaly and improved patient QOL. However, after a time, the proliferation persisted – the JAK protein proved resistant to inhibition. More importantly, ruxolitinib did not, in general, affect the underlying progress of the MPN disease or significantly reduce the allelic burden. The key insight into this persistence was provided by Levine in his 2012 publication isolating heterodimerization as the process through which related JAK kinases were recruited to augment the inhibited JAK2 molecule. Now, with publication of the Cancer Cell study of CHZ868, the work of Levine’s lab and that of his long-time collaborator, Novartis’ Thomas Rademerski, PhD., has taken a giant step forward toward unraveling the riddle of JAK inhibition. MQJ: Considering the promising results reported across the board, I’m surprised CHZ866 is not being widely talked about. LEVINE: The paper just came out. Our goal is not get publicity, it is to help people with our discoveries. MQJ: Much of the material published in Cancer Cell was presented at ASH 2014. What’s the main difference? LEVINE: This is the final paper. The work presented at ASH in December was an earlier version of this work. In 10 minutes at ASH you can’t cover everything. Some of the wild type vs mutant results, some of the data on toxicity, and lack thereof, in mice is new. Really it’s just the difference between presenting and publishing. We’ve done more work to extend the finding, incorporating reviewers’ suggestions and completing the story. There’s nothing massively different. In the paper are some of the things we did that we didn’t present. And there’s some work in primary patient samples and little bit more on the mechanistic work on the phosphorylation sites which we did after the ASH meeting. LEVINE: I think that’s just the name of the scaffold, the class, the whole series of chemical probes. These scaffolds are previously known but the idea of developing a compound from this class that can inhibit JAK 2 is novel. About three years ago Tom Radermerski (Novartis) published a paper in Cancel Discovery reporting on a molecule that bound JAK2 in a different conformation. The initial molecules in that paper were made for other reasons and he found they had JAK inhibitory activity. His work suggested developing a molecule in this class more specific for JAK2, develop something that could actually be more potent and specific.That original paper was really quite important. MQJ: When did you and Thomas Radimerski connect? LEVINE: Thomas and I have worked together now for 7 or 8 years. My lab has had a very longstanding collaboration with Novartis and with Thomas. He is a remarkable guy, incredibly insightful and bright and knows a lot of biology and drug development. We have a longstanding collaboration that predates this project. This was just another in a series of projects in which we have been able to do great work together. But without Novartis and their ability to develop and characterize molecules we couldn’t do what we do. MQJ: What’s driving this Type II inhibition work? LEVINE: It’s sort of the canary in the coalmine. Basically the thing that was clear was that with all the current drugs, including ruxolitnib and other JAK inhibitors in clinical trial, you see freezing of the molecule at a phosphoryated site. But when you look at JAK2 phosphorylation directly it did not go down. 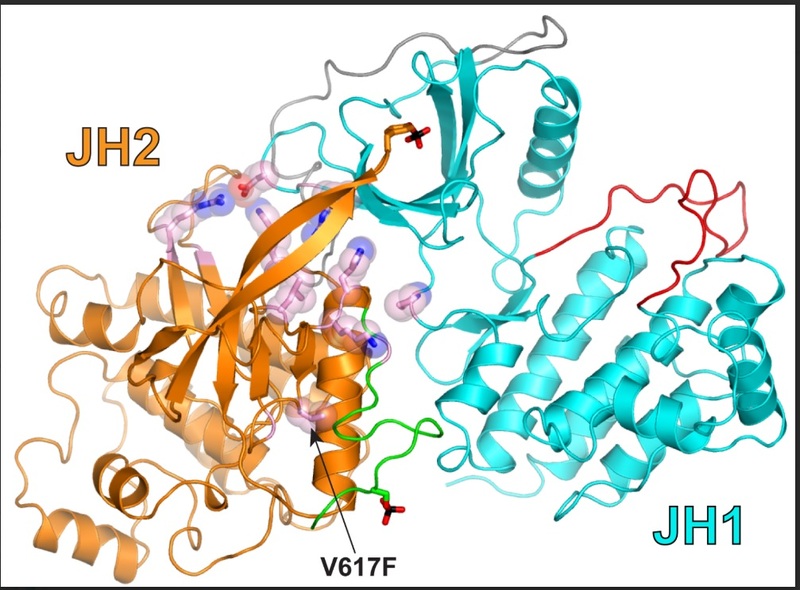 What that is suggesting is that these are Type I binders of an active JAK kinase domain and that led us to ask if a Type II binder of the inactive state of that domain might have a different effect. That was the indication that there was an aspect of this that might be leveraged by going after it from a different direction. It doesn’t tell you if do the experiment it will be better, just different. It doesn’t say different will be better. The stabilization by the Type I inhibitor isn’t inherently limited. It just meant there was another chemical approach that was possible and we could see if it was more potent. MQJ: Does Type II inhibition involve the pseudokinase? LEVINE: No let’s get that straight. The pseudokinase is a domain in JAK2 that can modulate kinase activity. Totally different. MQJ: You wrote, Type II stablilizes the inactive conformation, decreasing phosphorylation. What is being stabilized? LEVINE: JAK2 like many other kinases can cycle between different states The most important of which is an active state where it can be catalytically active and impact downstream molecules, like STATS, and an inactive state where it cannot. And drugs can bind either or both states. Ruxolitnib and other drugs bind the active state. That’s usually how inhibitors are developed. You bind the target when it’s ready to work. You’re competing out with the ATP. But you can also bind the inactive state. Basically you are not allowing JAK2 to cycle to the active state. You’re preventing its ability to change conformation. MQJ: You’re doing that by decreasing phosphorylation in the activation loop? Is that where it’s taking place? MQJ: OK I’m sure that makes sense to you but I don’t understand. LEVINE: Real contact means the drug is physically attached to JAK2 so for JAK2 it inhibits its ability to cycle. It’s like sitting vs standing If someone is sitting on you, you can’t stand. MQJ: Right across the board in murine models all reported results are excellent. Reduction of symptoms, fibrosis, allele burden. Do you see that extending to human trials? LEVINE: All I can say is we’re pretty encouraged that we see better inhibition of the target and better efficacy than we do with other molecules we’ve used. We’re quite hopeful this will lead to clinical efficacy in the clinic when better molecules are brought forward. But a lot of things that work in mouse models don’t work in people so we have to be very cautious about how we extrapolate what we see in the lab to what we will see happen in the clinic. MQJ: WHY Would CHZ868 preferentially target the mutated JAK2 vs. the wild type (unmutated)? LEVINE: That’s a great question and I think that’s one we don’t fully understand. I think that to some degree we know that the mutant protein appears to be more sensitive than the WT to a measurable extent and it suggests some interesting biology about the amount of time that mutants and wild type JAK2 spend in sitting versus standing. That will have to be explored in subsequent studies. I think that at this point we have observational data but we don’t have a reason yet why. MQJ: We saw nothing on toxicity in this paper. LEVINE: Toxicity was in the companion paper on ALL and the supplement. Actually there was not as much toxicity as we would have anticipated. MQJ: How about driving down platelets, thrombcytopenia. LEVINE: I think thrombocytopenias with JAK inhibitors is an area that is not as well understood as people think. I am not yet sure that I understand the basis and it’s an area that we and others are trying to figure out. That ‘s a very careful way of saying I don’t know why this drug, and why some other JAK inhibitors, do not cause significant thrombocytopenia. MQJ: What kind of thrombocytopenia effects did you observe among the mice. LEVINE: We didn’t see that much but ultimately we did see some. We have to move forward slowly. MQJ: How would CHZ868 impact other JAK2 processes like digestion? LEVINE: I think what we can say is generally it is well tolerated There appears to be an effect on the mutant cells at a dose that does not suppress normal red cell or platelet production. And it suggests there’s another way to go after this than what’s being done currently. MQJ: Are you anticipating clinical trial in the near future? I think more importantly, after the development of ruxo and the other drugs in clinical trial there has been a little bit of a lull about developing new clinical therapeuetic approaches in the JAK2. I think our work and the work of Stevan Hubbard and his colleagues on the crystal structure of the mutant should help move things along. We need a renewed effort to target JAK2 using new modalities. MQJ: What does it mean that CHZ868 is not a tractable drug? LEVINE: That is a question for the chemists. From what I understand there are features which preclude developing it in the clinic, which does not have to do with its mechanism of action as a type II drug. MQJ: In retrospect, how do you look at this work? LEVINE: For us it’s exciting for three reasons. First scientifically discovering something not previously known. Then seeing my trainees work together to publish a nice paper. Most importantly, it really follows a series of papers we’ve been working on for a decade which we believe will continue to impact, and work toward helping, our MPN patients. It is yet another chapter in a long story that is evolving.